Wash asparagus and cut off 2cm from the bottom of the asparagus. Cut into 5cm lengths on an angle. Heat oil in wok on medium low heat. Saute garlic till fragrant and add asparagus and continue to stir fry for 2-3 minutes. Mix cho-gochujang in a small bowl. Pour the mixture over the asparagus, and stir well to coat. Reduce heat to low and cover. 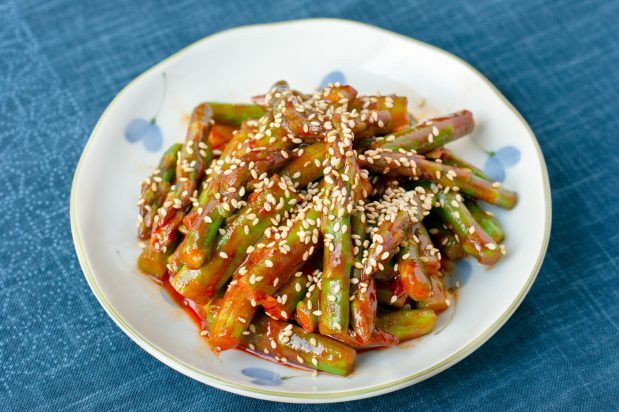 Cook for 5-6 mins or until tender and stir again to evenly coat the asparagus before turning off heat. Remove onto plate and garnish with sesame seeds.